William Louis Beaufort was the son of the map-maker, diarist and Rector of Navan and Collon, the Rev. Daniel Augustus Beaufort. He as a pupil of Nicholas Pocock in Bristol and later in Dublin of a James George O'Brien. He has previously been confused with William Beauford (1735-1819) an amateur antiquarian draftsman, working in Dublin and who contributed to the Antiquities of Ireland, 1790. The Augustinian priory was founded by the Earls of Kildare in the early 14th century. It became and remained the home of the Augustinian Order until they were driven out, in the mid 15th century. The Priory was suppressed and badly damaged during the reign of King Henry VIII. Repaired and renovated during the early part of the 19th century, the building is regarded as a fine example of what a mediaeval Irish church. 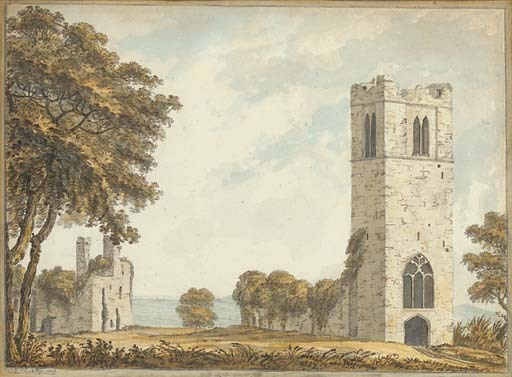 The present watercolour shows the priory before it was restored. The building has been used as the local Protestant Church since the early 19th century. At Slane are the ruins of a Franciscan Monastery built in 1512 by Christopher Fleming. Above the monastery the hill is dominated by the belltower of Saint Patrick's Church.